Marc Destrubé and the three Dutch masters of the period instrument revival who will join him for this recital of chamber music by Telemann and C.P.E. Bach have been at the forefront of the international early music movement for over 30 years. All former instructors of our long-running Summer Baroque Instrumental Course at UBC, these four great artists have played pivotal roles in inspiring and teaching the next generation of Early Music artists. They have also individually enjoyed long and illustrious careers as soloists, chamber musicians and musical leaders all over the world – we could not imagine programming EMV’s 50th anniversary without them. This programme will feature a selection of highly expressive chamber music from the late 18th century repertoire known as the Style Galant. Canadian violinist Marc Destrubé is equally at home as a soloist, chamber musician, concertmaster or director/conductor of orchestras and divides his time between performances of standard repertoire on modern instruments and performing baroque and classical music on period instruments. As a concertmaster, he has played under Sir Simon Rattle, Kent Nagano, Helmuth Rilling, Christopher Hogwood, Philippe Herreweghe, Gustav Leonhardt and Frans Brüggen. He is co-concertmaster of the Orchestra of the 18th Century with which he has toured the major concert halls and festivals of the world. He was concertmaster of the CBC Radio Orchestra from 1996 to 2002, concertmaster of the Oregon Bach Festival Orchestra, and founding director of the Pacific Baroque Orchestra. He is first violinist with the Axelrod String Quartet, quartet-in-residence at the Smithsonian Institution in Washington D.C., where the quartet plays on the museum’s exceptional collection of Stradivari and Amati instruments. He has also performed and recorded with L’Archibudelli and is a member of the Turning Point and la Modestine ensembles and Microcosmos string quartet in Vancouver. He has appeared as soloist and guest director with symphony orchestras in Victoria, Windsor, Edmonton and Halifax as well as with the Australian Brandenburg Orchestra, Portland Baroque Orchestra and Lyra Baroque Orchestra. A founding member of Tafelmusik Baroque Orchestra, he has appeared with many of the leading period-instrument orchestras in North America and Europe including as guest concertmaster of the Academy of Ancient Music and of the Hanover Band. Marc has recorded for Sony, EMI, Teldec, Channel Classics, Hänssler, Globe and CBC Records. Jacques Ogg is a performer and recording artist on both harpsichord and fortepiano, as well as a conductor. He teaches at the Royal Conservatory in The Hague. He was born in Maastricht (The Netherlands) and studied harpsichord in the city of his birth with Anneke Uittenbosch. In 1970 he went to study with Gustav Leonhardt at the Amsterdam Conservatory, from which he graduated in 1974. He currently serves as Professor of Harpsichord at the Royal Conservatoire in The Hague, where he teaches primarily harpsichord. Jacques Ogg’s current activities include solo recitals on harpsichord or on fortepiano, concerts with flautist Wilbert Hazelzet. He has been a member of the Orchestra of the 18th Century and has performed regularly with Concerto Palatino. He is frequently invited to conduct masterclasses and summer courses, among others in Juiz de Fora (Brazil) and Buenos Aires, in Mateus (Portugal), Salamanca (Spain) as well as in Cracow (Poland), Prague and Budapest. He was invited as a juror in competitions such as “Bach Wettbewerb” (Leipzig) and “Prague Spring”. Jacques Ogg is artistic director of the Lyra Baroque Orchestra in Minneapolis/Saint Paul. Jaap ter Linden, cellist, gambist, and conductor, has a long history in the Historical Performance world. His many tours have taken him to countries throughout Europe, Japan, Australia and the United States, often with only the music of Bach in his backpack. 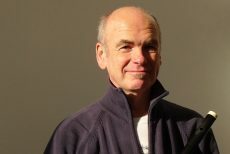 As conductor, he has worked with ensembles such as the Handel and Haydn Society, Philharmonia, Portland and Lyra Baroque; Arion and Tafelmusik; the Wroclaw Symfonie in Poland; Bordeaux Opera in France, and many others, performing repertoire from the 18th and 19th century, from Purcell to Mendelssohn and Schubert. He has numerous recordings to his name, notably the Bach cello suites, which he has recorded twice. His latest recording, the complete sonatas for cello and piano by Beethoven, with David Breitman, has been released this year. With his Mozart Akademie in Amsterdam he recorded the complete Mozart symphonies, to great acclaim. He finished many years of of teaching at the Royal Conservatory Den Haag in 2016 when he moved to the United States where he started teaching at Case Western Reserve University and the Cleveland Intsitute of Music in September 2018. His latest tour, in March 2019, brought him to China where he performed all of Bach’s 6 cello suites. Wilbert Hazelzet started his career in 1972 in Musica Antiqua Amsterdam (Marie Leonhardt); he has been principal flautist of The Amsterdam Baroque Orchestra(TonKoopman) from 1978. He was member of Musica Antique Köln until 1985; with Ensemble Sonnerie London and Cantus Coelln he performed until 1995. Apart from his recitals with Jacques Ogg and lutenist Joachim Held, Hazelzet is a frequent guest in The Lyra Baroque Orchestra Minneapolis, Camerata Kilkenny, Passamezzo Antiguo Bilbao and Musica Amphion Netherlands. Erato France, Die Deutsche Grammophon Gesellschaft – Archiv Hamburg, edel-Classics Berlin, Harmonia Mundi Germany, Philips, Harlekijn and Globe Holland, Virgin-EMI London and Glossa Music Spain published Hazelzet’s recordings. Hazelzet teaches at the Conservatories of The Hague and Utrecht; his masterclasses take place at the universities of Salamanca, Granada, Seville, Vancouver, London and Minneapolis.